Heat a pot and put the tomato and garlic. Fold in ground beef and season with salt, cumin, paprika and chili powder. Mix well and cook until the meat turns golden. Set aside. Place the cilantro, cream cheese, chicken broth and milk in a blender. Process until you obtain a thick sauce. Cut the avocados in half and remove seeds. With a spoon, remove a bit of the pulp and place the meat inside. Top with creamy cilantro sauce and grated queso fresco. You can replace ground beef with shredded chicken. 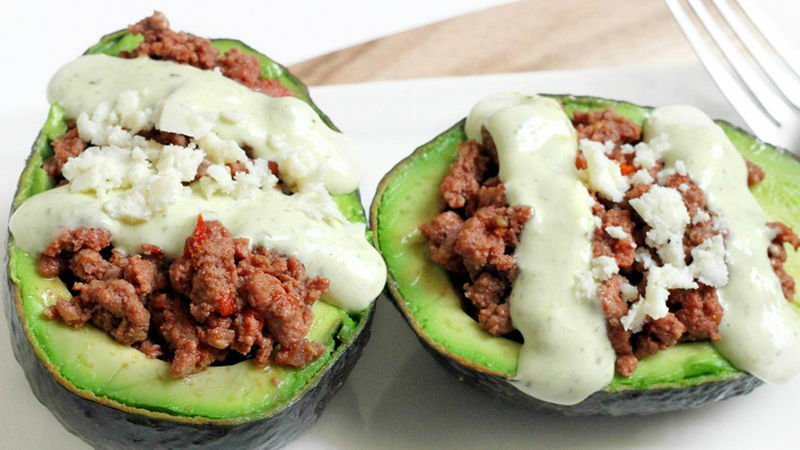 These stuffed avocados can be your perfect entrée at an important dinner. They're very easy to prepare and so tasty to enjoy! The combination of avocados and the meat seasoning make this a very special dish, especially with the creamy touch of the cilantro sauce. You will be surprised about how great they are! These stuffed avocados can also be a great light dinner option. You can even prepare a large batch of cilantro sauce and store to use it for all your dishes. You're sure to love them!